Here’s a fun math activity that combines counting, one-to-one ratio, numeral recognition, color recognition, sorting, graphing, number comparison, and well, sugar! That’s a lot to do in one activity, but I promise, your kiddos will enjoy it nonetheless. And it’s only partly because of the sugar part. Children are natural sorters. That’s why they create collections, line up possessions, and don’t want their food touching each other on their plates. Use that natural compulsion in this Valentine candy heart activity. 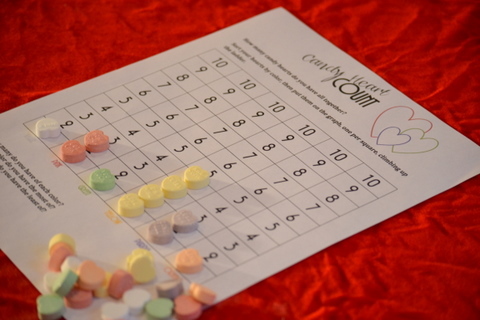 Start out with this Candy Heart Counting Sheet. (Under each color name, I usually draw a line in the corresponding color just to help out. *** OR print one of these new, updated sheets: Full Color or Black and White.) Give the children each a small amount of candy hearts. The amount will likely depend upon the child’s ability level or familiarity with counting. Briefly show them how to sort and count by lining up the candies on the boxes. Observe and help out as they go along. As each child finishes, ask questions similar to those on the bottom of the sheet. How many do they have of each color? Which color do they have the most of? etc. If you’re working with older children, you may want to have them color in the boxes after they remove the candies to create a bar graph. You could also extend the activity by having them create patterns with the candies as well! Math has never tasted so sweet! For more Valentine’s ideas, check out the Valentines, Friends, and Communication unit page here. what a great valentine’s activity!! love it! Thanks for sharing this awesome activity. My daughter and I did it yesterday and she wants to do it again today! So glad she enjoyed it. Your pictures are darling! Thanks for sharing. I would love to share this on my blog, is that ok? I love that idea! Thanks for sharing, Diana!